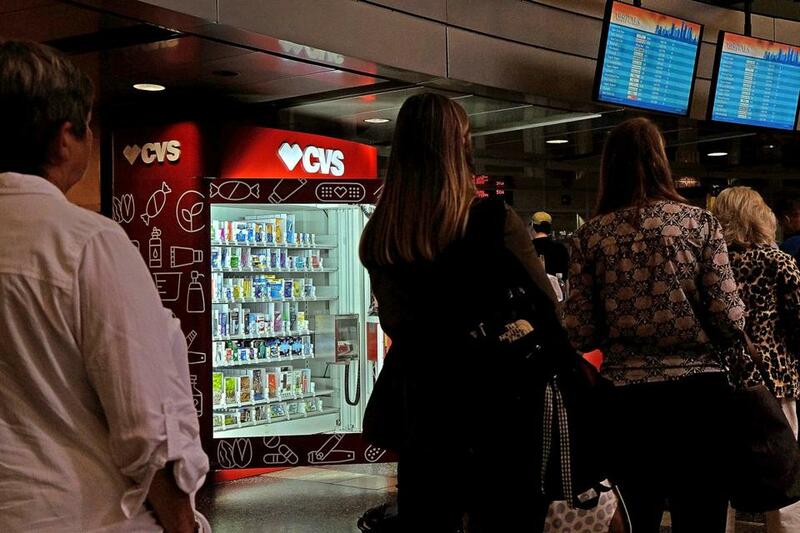 Passengers waited in line next to a CVS vending machine being set up at the South Station bus terminal. In an attempt to think outside the box, CVS Health is creating some boxes of its own. The pharmacy giant said Thursday that it will begin putting vending kiosks in high-traffic areas like airports, bus terminals, and college campuses designed for customers on the move. The first kiosk is up and running in the South Station bus terminal. New York’s LaGuardia Airport will also be among the first locations to have the vending machines. The Rhode Island company said it plans to install 25 vending machines throughout New York and New England this fall, and could roll out an additional 50 soon after. The machines will be stocked with items like deodorant, toothpaste, and contact solution for the forgetful traveler, along with healthy snacks and other on-the-go necessities like batteries, lint rollers, and stain removers. Vending machines have always combined marketing and customer convenience, from the ubiquitous Coca-Cola machine to Best Buy’s successful electronics kiosks, said Peter Killian, a retail analyst with Cambridge Group. The clothing brand Uniqlo and Benefit Cosmetics have also recently experimented with the kiosk concept. The company says the kiosks will have touch screens and carry over 70 products. But as for right now, they won’t take ExtraCare coupons. You’ll still need to visit a brick-and-mortar store for that. Janelle Nanos can be reached at janelle.nanos@globe.com and @janellenanos on Twitter.